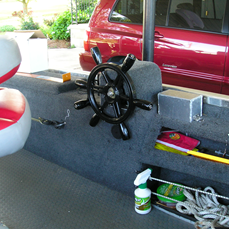 Gives you the clearance in the boat of stick steering but the safety of hydraulic steering with a wheel. Replacement for stick steering and makes it much easier and much safer to steer. Turns the engine full travel – Rhino’s Hydro- Port Steering you have to try it! Watch the videos below – they say it all!